Was it only six months since my first book, Bright Sword, was published? It must have been, I remember the freezing cold of my book launch, when my Anglo-Saxon warriors administered mead to the handful of customers who braved the icy streets. Now we are in the midst of a heat wave and thunderstorms. For all this time friends have asked, “How is it selling?” and I reply “I haven’t the faintest idea.” The only indication is the graph on my Amazon Author Central page – a jagged line for the first couple of months then a general decline. There are occasional upward turns, there has been on the last few days. Why? I checked the price and discovered Amazon have reduced the price, again. The book is now £3.72, cheaper than the e-book at £3.99. Why does nobody tell me these things so I can pass on the news? Should I be checking the price every day? There’s probably something I can set up that will tell me. Anyway, I now know exactly how many books I have sold – at least up to the end of June. Yesterday I received my first Royalty Statement from my publisher (I had to rescue the e-mail from my spam folder – good job I check it occasionally) They sent me money! Not a fortune but it proves that someone has bought my book. Several someones and not all of them family and friends! The bad news, for me, is that there are still plenty of copies in stock. But it’s good news for anyone thinking of buying a copy, especially at (did I mention the price?) only £3.72 – see here. What have I learnt over these six months? The first thing is that I am not very good at selling myself. I haven’t even managed to get my book into my local library, despite giving them a free copy. Did they not think it good enough or is it languishing forgotten on a shelf somewhere? I already knew this. I am the sort of person who has a tendency to say “I’ve written a book, it’s not bad, but it could be better. Would you like to read it? That’s all right, it’s probably not your cup of tea.” I must be more assertive. “Buy my book or I’ll kidnap your husband/children/cat and torture them until you read it and post a five-star review.” A bit over the top? Perhaps. I must try to find a happy medium – slightly more posts on twitter/facebook? On the other hand, I have been writing, rewriting and editing book two. 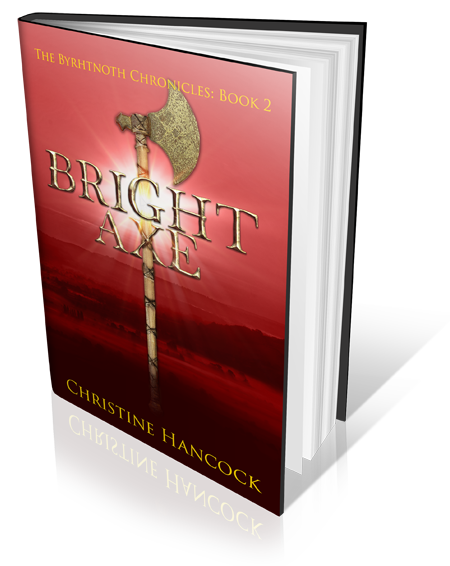 Bright Axe is now finished. It will go back to the editor soon – more about that another time. Then I’ll have to think about publication. Do I go back to the publisher of Bright Sword? Have I sold enough copies of the first book? If they offer me the same (partnership) deal should I accept? Would I be better off with straight self-publishing? It would mean more work, but more control about what happens. Do I put more effort into Bright Sword or concentrate on publishing Bright Axe? So many decisions to make. About when to return to the first draft of book three. About plans for book four and whether the story will finish there. I had a sudden revelation. If I finish the Byrhtnoth Chronicles with book four – what will I write next? It was that, not the receipt of a royalty payment or anything else, that stopped me in my tracks. I am no longer someone who has had a go at writing a book. I am a writer – and I’m not sure I can stop. I have never been to Tamworth before. I don’t know why, it’s only about 30 miles away, straight up Watling Street. Perhaps because I’ve never had a reason to go. This weekend, there was a very good reason, it was Aethelfest. This was a celebration of Aethelflaed, Lady of the Mercians, who died in the town 1100 years ago, in 918. I’m not sure why a town would celebrate the death of a famous visitor – not exactly good publicity. Although it can happen (Maldon, 991?). So who was Aethelflaed? For anyone who has missed all the publicity, she was the daughter (and eldest child) of Alfred the Great and like him, she fought the Danes, driving them out of Mercia. She was not a Queen, because her husband, Aethelred (no, not that one!) was not a King. 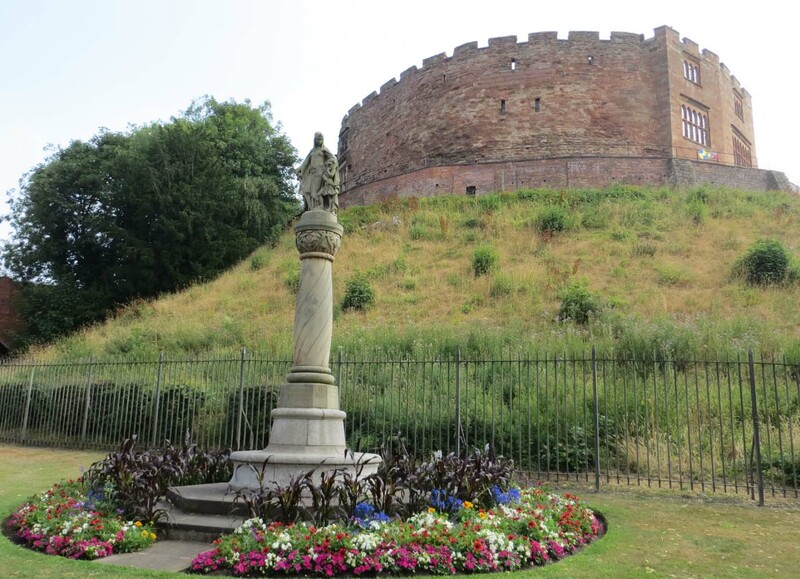 Who he was is a mystery and one of the subjects that was covered at the event, organised by Tamworth Literary Festival – Aethelflaed and Women’s Worlds: Reconstructing Early Women’s Voices. I had seen this advertised some time before and had been attracted by the fact that two very good authors were taking part, both of whom have written about “my” period. Since it was held only a few days after my birthday, I knew I had to go. I allowed plenty of time for the journey, and arrived an hour early, finding a car park right next to the venue. Plenty of time to have a look round the town. There were plenty of boards so I learned something of the history of the town and ended up at the castle. 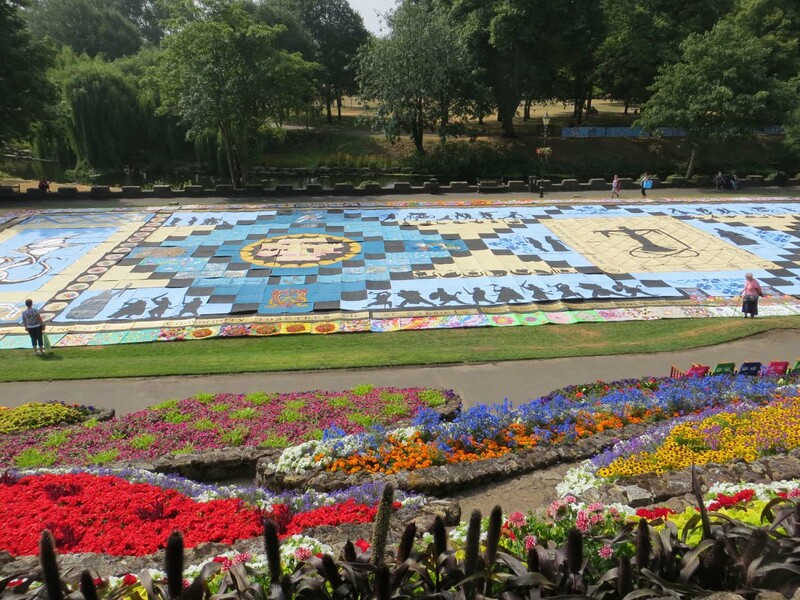 unfortunately I didn’t have time to visit but wandered round the Castle Grounds where there was an Anglo-Saxon encampment and the display of a colourful Aetheflaed mosaic. 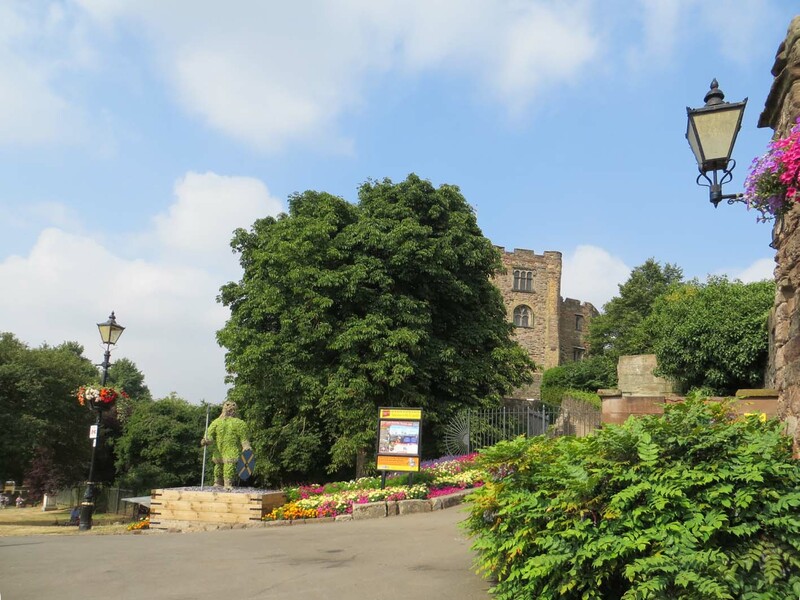 The Castle was Norman but Tamworth was important long before, as the capital of Mercia, home of King Penda and King Offa. It was sacked by the Danes in 874 and rebuilt and fortified by Aethelflaed in 913. I would have liked to have spent more time exploring but I had to get back for the main attraction. After an introduction by Dr Sara Read, the speaker was Annie Whitehead. Annie has written several books, one, “Alvar the Kingmaker”, actually includes a character I have written about – although from a vastly different viewpoint. Today she was talking about Aethelflaed, whose life she has written about in “To be a Queen”. She told us about Aethelflaed and how little information there is actually is about her. Was it because she was a successful woman in a man’s would, or was it for political reasons? The Kings of Wessex were eager to take over Mercia and when Aethelflaed died, leaving only a daughter to succeed her, she was quickly “rescued” by Aethflaed’s brother, King Edward and never seen again. Annie has cleverly taken what is known and woven it into a plausible story, interpreting the facts to fit what might be what happened. I recommend her latest book “Cometh the Hour” about King Penda, an interesting view of a king who is usually the antagonist in other books set in this earlier, 7th century, period. It provides an explanation of the burial of the Staffordshire Hoard. Annie also has a non-fiction book coming out in September, “Mercia: The Rise and Fall of a Kingdom“. I look forward to reading it. The second speaker was treading on dangerous ground. 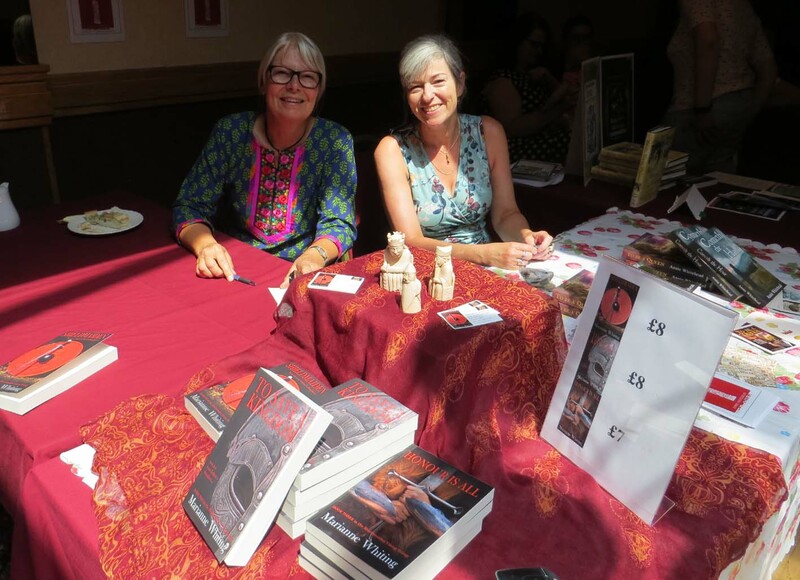 Marianne Whiting is a Viking – or perhaps I should say a writer about Vikings. Born in Sweden, she was captured by a local while on a course at Birmingham University and has been held hostage ever since. She explained how the Vikings were not (just) the rapists and pillagers we know and love, but traders, merchants and innocent settlers. She described the difficulties of writing about writing in a time when beliefs and customs were very different from today. Should she leave out descriptions of animal sacrifice that might shock the modern reader? She doesn’t and her books, the Shieldmaiden Viking Trilogy are all the better for it. We are immersed in ordinary farming life of settlers in the English Lake District. Sigrid Kveldulfsdaughter is a shieldmaiden. She fights for her land, her family and her honour. Politics intervene, her uncle is Eirik Haraldson (Bloodaxe) sometime King of Jorvik over the period of the books. I had read the first two, “Shieldmaiden” and “To Save a Kingdom” and was particularly interested to buy the third “Honour is All” as it deals with the same period, and some of the same characters, that I am struggling with. I have read and finished it (which is why I didn’t write this blog yesterday) and it was everything I wished for, with a wonderful ending. The third and final speaker was Dr Jennifer Evans talking about medical treatment of medieval women. Her speciality is the Early Modern Period but she spoke to us about a little known woman called Trotula said to have been the first female professor of medicine in eleventh- or twelfth-century Salerno, who wrote a textbook on women’s medicine. This was a very amusing talk about some of the “cures” for various ailments, mostly of women but sometimes men. The main method of administration was by fumigation, which meant that the doctor didn’t need to look at or touch the woman at all. The speakers were followed by questions and then a buffet lunch. There was plenty of time to chat and buy books.